IT'S GOING TO BE A HOT NIGHT IN GEORGIA! Come out and be a part of the 9th Annual Heat of the Night Retro 5K in Watkinsville, Georgia. Our NEW LOCATION is the Oconee County Middle School and the race will be run on paved surfaces. 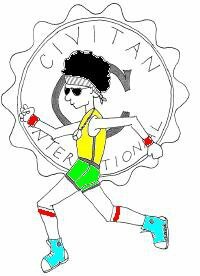 Proceeds from the race will benefit the Oconee Civitan. Race Day Registration and Packet Pickup: Begins at 6:30PM. Far Out Retro Awards will be given to the overall Male/Female, Masters Male/Female, and top three Male/Female winners in age groups beginning 10 and under through 75 and over. Shirts are guaranteed to pre-registered participants registered by 7/14/18. Registrations after that date are not guaranteed a shirt or size. There will be plenty of snacks and fluids after the race.